Mouse anti Human CD312 antibody, clone 2A1 (MCA2330) used to evaluate EMR2 expression in treated HEK-293 cell lysates by western blotting. (A) Schematic representation of the chimeric EMR2-WT-PAR1-myc and EMR2-S518A-PAR1-myc proteins. The EGF-like 1, 2 and 5 motifs of EMR2 protein are represented by three triangles. The GPS and thrombin cleavage sites are indicated by a black and a gray arrow, respectively. The myc tag is represented by a black circle. (B) WB analysis of HEK293T cells expressing EMR2-WT-PAR1-myc (#1) and EMR2-S518A-PAR1-myc (#2) treated with or without thrombin. Note the sizes of the thrombin-released NTFs in supernatant (white and black stars) are bigger than the NTFs remained in cell lysate (white and black arrows). (C) Flow cytometry analysis of the surface EMR2 expression of transfected HEK293T cells treated with (dash line) or without (black line) thrombin. Mock transfected HEK293T cells were negative controls. (D) WB analysis of supernatant and cell lysate of thrombin-digested HEK293T cells expressing EMR2-S518A-PAR1-myc treated with indicated de-glycosylation enzymes. The heterodimeric and membrane-associated EMR2-NTF molecules are indicated by a black star and a white star, respectively. (E) WB analysis of supernatant and cell lysate of PFO-treated HEK293T cells. Transfected cells expressing EMR2-WT-myc (#1), EMR2-S518A-myc (#2), EMR2-WT-PAR1-myc (#3) and EMR2-S518A-PAR1-myc (#4) were treated with or without thrombin first, washed and incubated with 0.2% PFO. Supernatant and cell lysate were then collected and analyzed by WB analysis using 2A1 and anti-myc mAbs as indicated. The white arrowhead and asterisk indicate the NTF and CTF of EMR2-WT-myc respectively, whereas the white arrows represent the EMR2-S518A-myc. The black arrow indicates the uncleaved EMR2-S518A-PAR1-myc protein, while the black asterisk indicates the cleaved PAR1 fragment following thrombin digestion. From: Huang YS, Chiang NY, Chang GW, Lin HH. Membrane-association of EMR2/ADGRE2-NTF is regulated by site-specific N-glycosylation. Sci Rep. 2018 Mar 14;8(1):4532. The hydrophilic characteristics of membrane-associated EMR2-NTF. (A) WB analysis of supernatant and cell lysate samples subjected to Triton X-114 phase separation. Supernatant and cell lysate were collected from PFO-treated CHO-K1 cells expressing EMR2-WT-myc. Ctl: input control protein samples before Triton X-114 phase separation; AP: aqueous phase; DP1 and 2: the first and second detergent phases, respectively. (B) WB analysis of membrane fraction of EMR2-WT-myc expressing cells after PBS, high salt (1 M NaCl) and high pH (100 mM Na2CO3, pH 11) treatment. S and L represent supernatant and cell pellets, respectively. The arrow indicates the specific Gαi1,2 protein band. (C) WB analysis of membrane fraction of thrombin-treated (T+) or untreated (T−) EMR2-WT-PAR1-myc expressing cells, followed by PBS, high salt (1 M NaCl) and high pH (100 mM Na2CO3, pH 11) treatment. Blots were probed with indicated mAbs. Mouse anti Human CD312 antibody, clone 2A1 (MCA2330) used to evaluate EMR2 expression in treated HEK-293 cell lysates by western blotting and immunofluorescence. Membrane-association of EMR2-NTF occurs in post-ER compartments. (A) Schematic representation of the chimeric EMR2-CD4 fusion proteins including EMR2-WT-CD4-HA-AATN (1), EMR2-S518A-CD4-HA-AATN (2), EMR2-WT-CD4 -HA-KKTN (3) and EMR2-S518A-CD4-HA-KKTN (4). The CD4 TM region and HA tag are represented by a single gray zig-zag line and a black hexagon, respectively. KKTN and AATN indicate the C-terminal ER retention signal peptide and control peptide, respectively. (B) WB analysis of total cell lysates of CHO-K1 cells expressing the respective chimeric EMR2-CD4 fusion proteins as indicated by the numbers in (A). Lysates were digested without (left panel) or with (right panel) Endo-H. The blot was probed with the 2A1 mAb. (C) FACS analysis of EMR2-NTF expression levels on cell surface and permeabilized whole cell of CKO-K1 cells expressing the respective chimeric EMR2-CD4 fusion proteins as indicated by the numbers in (A). (D) Confocal immunofluorescence analysis of EMR2-NTF expression patterns on cell surface (left panel) and whole cell (right panel) of CKO-K1 cells expressing the respective chimeric EMR2-CD4 fusion proteins as indicated by the numbers in (A). The red color represents EMR2-NTF stained by 2A1 mAb followed by goat anti-mFc IgG-Alexa Flour 647. The green color represents the ER marker expressed by the transfected pCMV-myc-ER-GFP plasmid, while the blue color indicates the nucleus stained by DAPI. Scale: 10 μm. Mouse anti Human CD312 antibody, clone 2A1 recognizes human EMR2, a member of the epidermal growth factor-seven transmembrane (EGF-TM7) family of proteins, which is closely related to CD97. EMR2, also known as CD312, is predominantly expressed on myeloid dendritic cells, monocytes and tissue macrophages. Various isoforms of EMR2 have been documented. 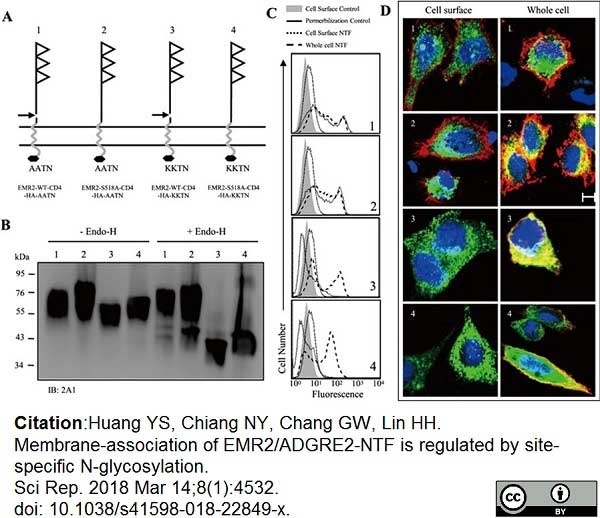 The ligand for the largest isoform of EMR2 has recently been identified as chrondroitin sulphate, which binds to the fourth EGF-like module of EMR2. Clone 2A1 specifically recognizes the stalk region of EMR2. NIH-3T3 cells stably transfected with EMR2 (EGF1-5) cDNA. Kwakkenbos, M.J. et al. 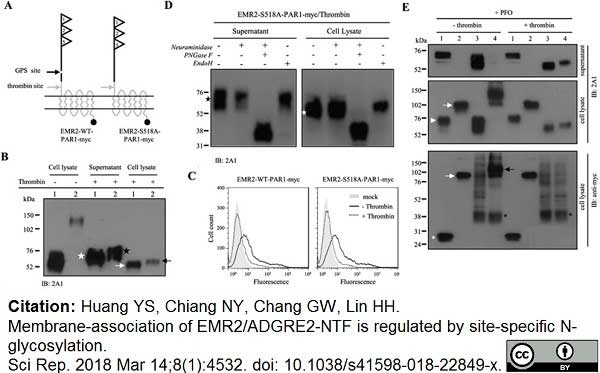 (2002) The human EGF-TM7 family member EMR2 is a heterodimeric receptor expressed on myeloid cells. J Leukoc Biol. 71 (5): 854-62. Stacey, M. et al. (2003) The epidermal growth factor-like domains of the human EMR2 receptor mediate cell attachment through chondroitin sulfate glycosaminoglycans. Yona, S. et al. (2008) Ligation of the adhesion-GPCR EMR2 regulates human neutrophil function. FASEB J. 22 (3): 741-51. Lin, H.H. et al. (2004) Autocatalytic cleavage of the EMR2 receptor occurs at a conserved G protein-coupled receptor proteolytic site motif. J Biol Chem. 279 (30): 31823-32. Huang, Y.S. et al. 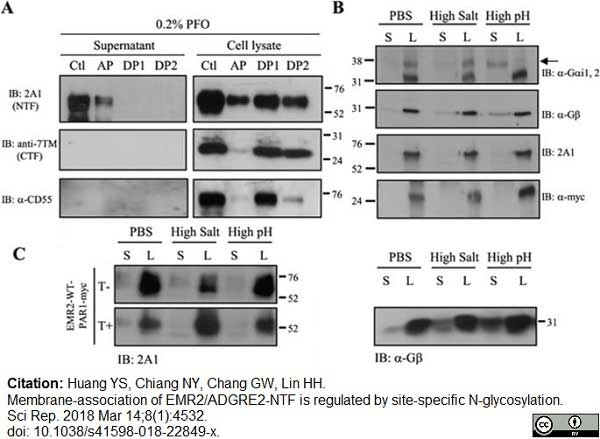 (2018) Membrane-association of EMR2/ADGRE2-NTF is regulated by site-specific N-glycosylation. Sci Rep. 8 (1): 4532. Kwakkenbos, M.J. et al. (2004) The EGF-TM7 family: a postgenomic view.